When I was a kid, many weekends involved a family visit to at least one fish market. Sometimes, cousins, uncles and aunties and grandparents came along. It was a social occasion. It was sight seeing. A big aquarium alternative where everything can be fashioned into a meal. To quieten us and keep us content until our yum cha lunch or dinner, our parents would buy us crabsticks to snack on. I think they were 50 cents and I’m sure we knew they weren’t real crab, but it didn’t matter. According to Wiki, the word “surimi” literally translates to “fish puree or slurry” and I suppose things like other kiddie favourites like chicken nuggets, hot dogs and cherrios (saveloy) are similar in build. These days I forget often about surimi as an ingredient. At my market, surimi comes in frozen vacuum sealed packs of 500 grams ($4) and 1 kilo ($7). This week the big Australian supermarket chains have frozen 1 kilo packs for just $5. Maybe that’s too cheap. You can often find surimi from the fresh seafood section of the supermarket, but I would stay away from those. You don’t know how long they have been thawed for. Better to thaw them yourself just before use. 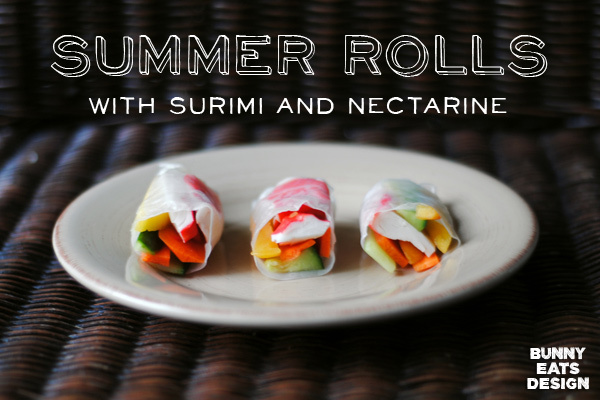 It is summer here so I decided to make a surimi summer roll with nectarine. You could make a peanut dipping sauce or use Hoisin sauce. Hoisin literally means “seafood” which is quite fitting. Though it does not actually contain seafood. Mine comes from a jar. Remove surimi from freezer and thaw. Peel and cut carrot into thin 10 cm (4″) long strips. Set aside. Peel the cucumber if you wish and cut into thin 10 cm (4″) long strips. Set aside. Peel the nectarine and cut flesh into strips. Set aside. Once surimi has thawed, break apart into pieces. Set aside. Add water to a dinner plate and immerse a sheet of rice paper for 2 seconds. Lift and drip dry for a few seconds, then lay on a clean chopping board. The rice paper will continue to soften on standing. Aiming for an imaginary horizontal strip in the centre of the sheet, place 2 pieces of surimi, then top with 2 pieces of nectarine 2 slices of cucumber and 2 slices of carrot. When the rice paper has softened enough to bend without breaking (about 30 seconds), fold the 2 edges towards the centre, the bottom edge to the centre and roll up. 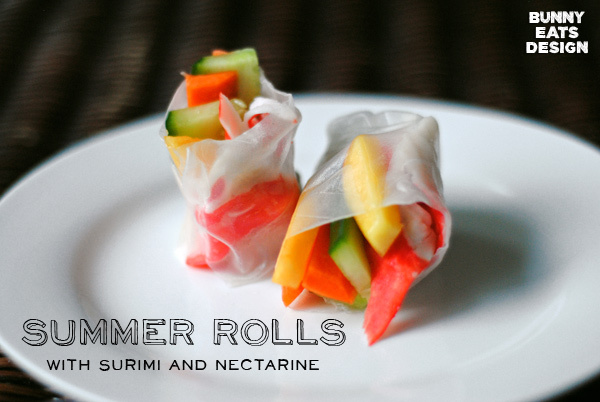 Place summer roll on a serving platter. Repeat until you have 12 rolls. Cut each roll in half if you like and serve with a small dish of Hoisin sauce. For those that have just joined me, you might also be interested in my first post on Summer Rolls and also my second post on Bacon Burger Summer Rolls. p.s. 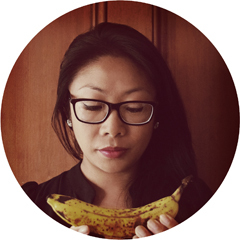 I love the name of your blog, I can relate. Oh, I forget about surimi too! I think that it only comes to mind when I am looking at California rolls (do you have those? I always wondered if they existed other places, or were called something else). But I love the combination of surimi and nectarine. I never thought to put the two together before, but somehow, it seems like a natural pairing. Yes, we have California Rolls here and that’s what they are called here too. Do you know if they are called that in Cali? I think they’re Californians call them California rolls too. It would be pretty interesting if they were called something else. Like what we call English muffins I think are just muffins or crumpets in Britain? I thought they might just call them something generic. There are a few American foods that we specify because we eat other versions here too. What you call a hot dog is an American hot dog here, and what we call a hot dog here, is similar to your corn dog. Our American mustard is your yellow mustard. I guess yellow mustard wasn’t specific enough when we already eat a whole bunch of yellow mustards? I love how colorful these look!